The Los Angeles County Museum of Art (LACMA) has recently acquired Siva in Motion (2012) by Shigeyuki Kihara: a silent dance video that conveys the wisdom and the beauty of Samoan dance while simultaneously echoing the destructive waves of the 2009 Pacific tsunami. Stills from Siva in Motion (2012) by Shigeyuki Kihara. Commissioned by the Auckland Art Gallery Toi o Tamaki, New Zealand. Courtesy of Auckland Art Gallery Toi o Tamaki, New Zealand; Milford Galleries Dunedin, New Zealand; and Shigeyuki Kihara Studio. Shigeyuki Kihara, an interdisciplinary artist of Samoan descent, based between New Zealand and Samoa, joins a list of prominent contemporary artists whose works have recently been acquired by the museum, including Roni Horn (USA), Choi Jeonghwa (Korea), Mitra Tabrizian (Iran); and masters Jean-Auguste-Dominique Ingres and Pablo Picasso. Originally commissioned by the Auckland Art Gallery Toi o Tamaki of New Zealand, Siva in Motion (2012) depicts a silent dance where Kihara appears dressed in the guise of ‘Salome’ – a ghost from the past performing the ancient Samoan dance form of the taualuga. The choreography describes the Pacific tsunami of September 2009, which took the lives of more than 189 people in American Samoa, Samoa, and northern Tonga. 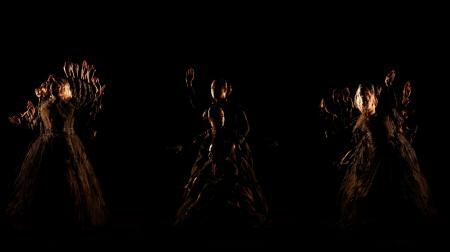 The video work also makes reference to motion photography in the 19th century, where the multiple fading figures echo the movements of the tsunami waves. Alongside her award-winning silent video work Galu Afi: Waves of Fire (2012), Siva in Motion (2012) addresses issues of cultural resilience in the face of frequent natural disasters in Samoa – which makes it both timeless and also utterly current. Siva in Motion (2012) has caught the eye of contemporary art museums internationally since it was first premiered at the Auckland Art Gallery Toi o Tamaki. It is featured in two group exhibitions in 2014: at Bozar Centre for Fine Arts, Brussels (Belgium) and Kurumaya Museum of Art (Japan) – where both exhibitions have an entire room dedicated to a single-channel, life-size projection of the work. Visitors to LACMA can view their new acquisition Siva in Motion (2012), which is currently installed in the Art of the Pacific Gallery, until September 2014. Kihara’s works and performances have been presented internationally at the Asia Pacific Triennial of Contemporary Art (2002), Metropolitan Museum of Art, New York (solo exhibition, 2008), Auckland Triennial (2009) and Sakahàn Quinquennial (2013) among others, and will be included in the upcoming Daegu Photo Biennale in September 2014.